There is a DIY super healthy salad bar chain in DC called Sweetgreen that I love. I could eat there every day and never get tired of it. I always get the same thing – a kale Caesar (hold the tomato) and a green juice for later. 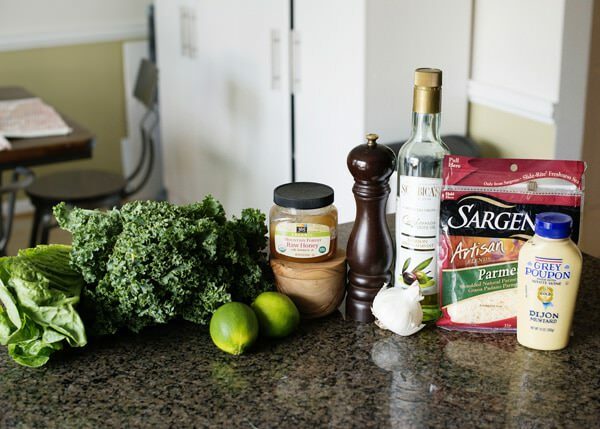 One of the biggest surprises from working with Sargento on my flavor journey is my new found love for kale and dark greens. 6 months ago I never, ever, ever would have ordered a kale salad. Now I want to eat it every day, and sometimes more than once a day. As much as I love going to Sweetgreen, it is kinda far from my house, and DC traffic is always a gamble, so I decided to make my own at home. It is just as good if not better, if I do say so myself. 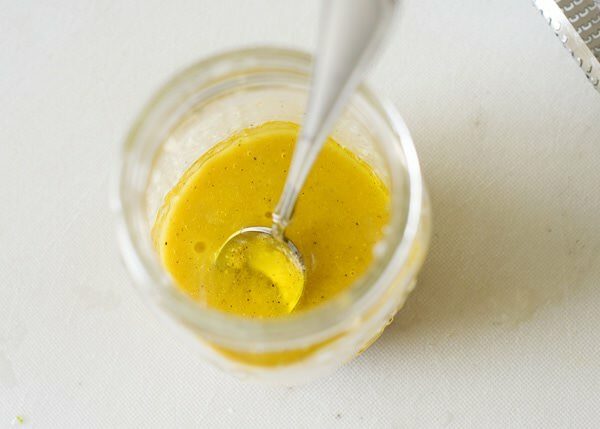 My version is a little different than theirs, I use a more vinaigrette-type dressing, and they use a creamy one. 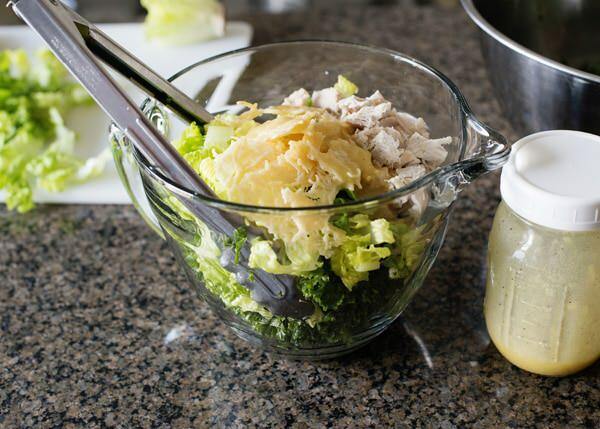 You could even use a high quality bottled dressing if you wanted to. In place of croutons, they use Parmesan crisps and it is a brilliant idea. 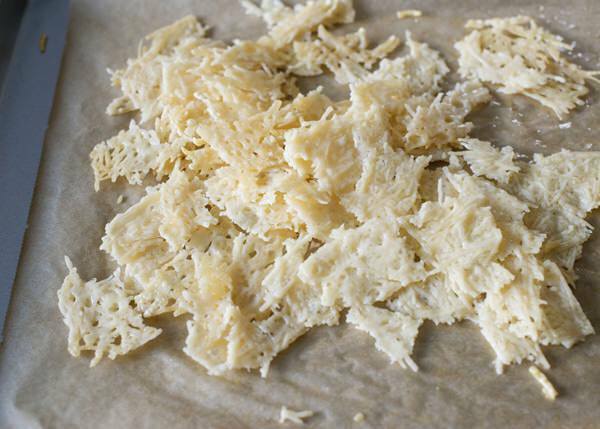 Parmesan crisps are really easy to make at home. 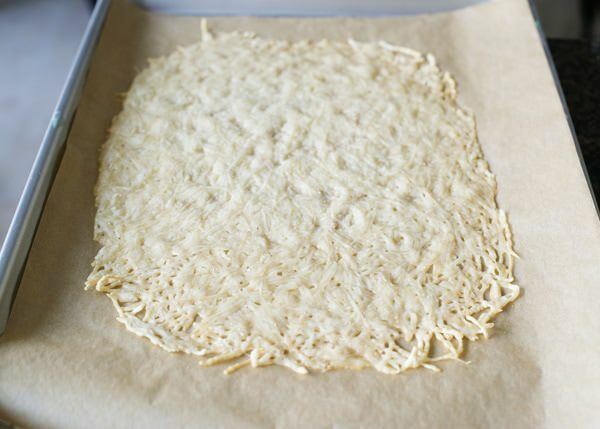 Just line a baking sheet with parchment and spread the cheese in a thin layer, bake until the edges are brown and crisp. The crisps are great in soups too. Another thing I love about this salad is the squeeze of fresh lime right before you eat it. I love the fresh hit. I would never have thought to do that on my own, thanks Sweetgreen! On a personal note, Happy Birthday to my Nonnie. Hope that your day is wonderful, we wish that we could spend it with you. xoxo. 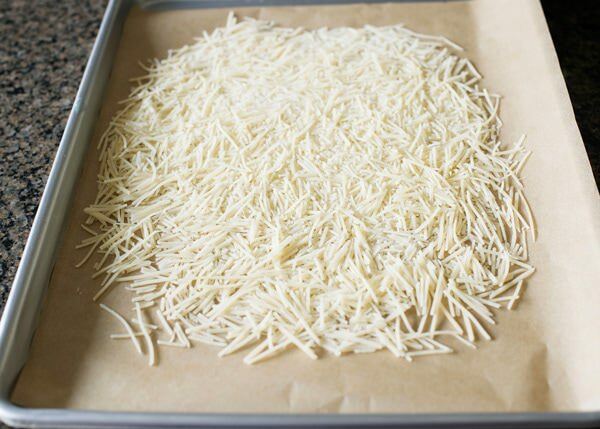 Bake for 6 to 10 minutes, until the cheese is melted and the edges are brown and crisp. Let cool completely and break into small pieces. 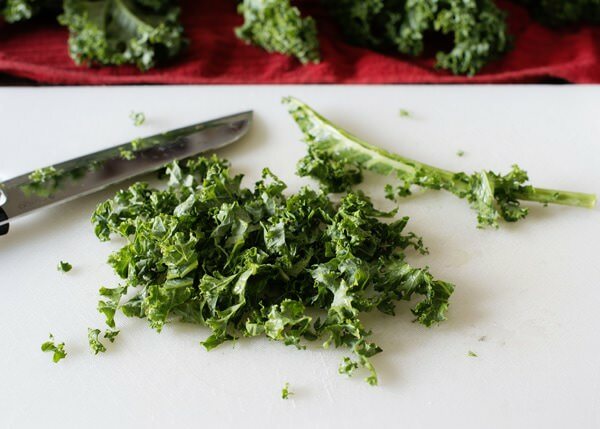 Wash the kale. Cut out the stalks. Cut into thin strips. Cut the romaine into thin strips also. 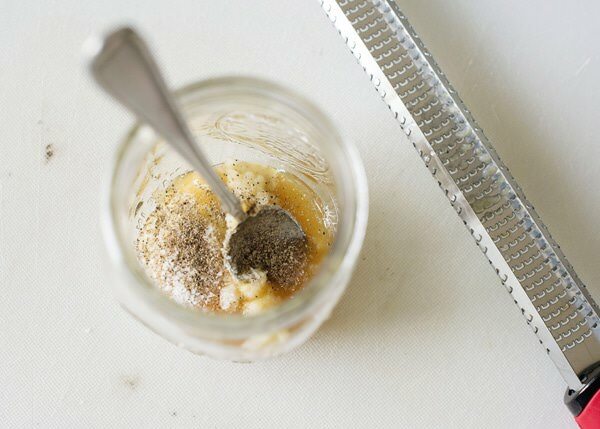 Add the garlic, Dijon, honey, lemon juice, salt and pepper to a mason jar. Shake well. 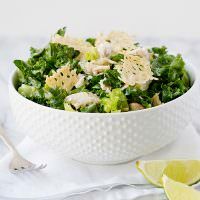 To make the salad, add the kale, romaine, chicken, and Parmesan crisps to a large bowl. Add about half of the dressing. Toss well, and add more dressing if needed. Preheat oven to 350 degrees. Line a baking sheet with parchment paper or a Silpat. Spread the cheese out into a thin, single layer. (Next time, I would probably do about 6 smaller rounds. I like the burnt edges.) Bake for 6 to 10 minutes, until the cheese is melted and the edges are brown and crisp. Let cool completely and break into small pieces. Serve with lime wedges and squeeze over the salad. This is one awesome salad!! 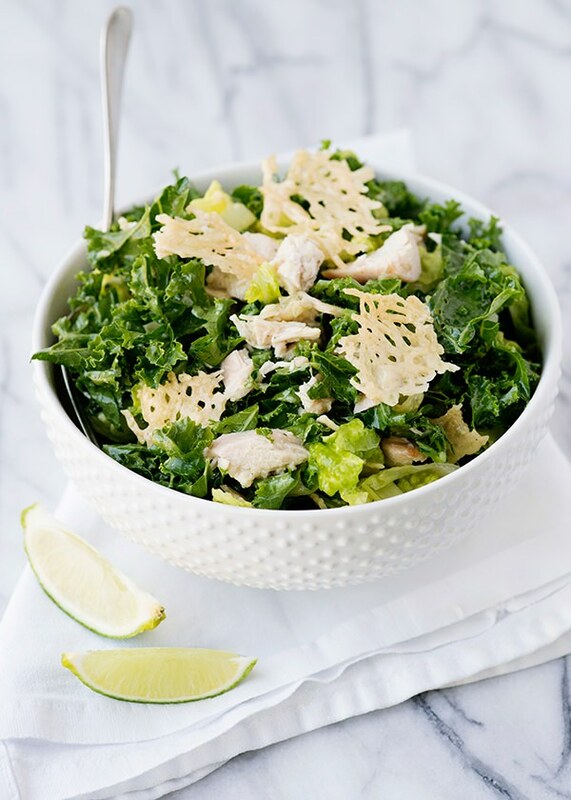 I love those parmesan crisp and the use of kale instead of lettuce. I love kale! I cannot take an ounce of credit, totally got the idea from Sweetgreen. I also love how the romaine cuts the kale a little and add some sweetness. I have a SweetGreen by me and I LOVE the Kale Caesar salad! I was skeptical to order it at first but I am so glad that I did. The best part is the parmesan crisps. Thanks for sharing this recipe…I look forward to trying it at home! I just made a kale salad last night. Loving Kale lately. Me. Too. Only mine is not so secret. AHH!! This is my new favorite salad! Sweetgreen just opened in Boston and I have yet to order anything besides this because it is so good. Love the recipe and can’t wait to make it at home now! I know! Isn’t it amazing? Gorgeous salad! This looks absolutely amazing, and I love your parmesan crisps! I must try making those, soon. Thank you Abbie! I could eat this salad every day. 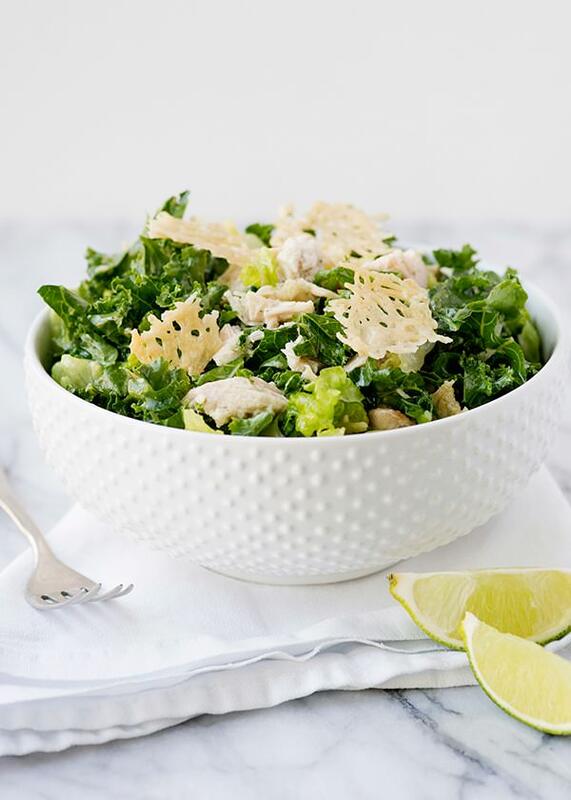 Kale in my caesar salad? I don’t really have a lot of love for kale, but this salad is certainly something I’m willing to try. Maybe it’s the parmesan crisps calling to me. You should give it a go. Even if you think that you don’t like kale. You might fall in love with it. What a great idea! The parmesan crisps are so innovative- I love it! Thank you! I cannot take the credit, it was all Sweetgreen’s idea. Wow! I am so glad that you love it as much as I do! Gotta love recipes where you can get just about everything at a farmer’s market! made this last night and loved it! those parmesan crisps need to make a regular appearance in my life.. thank you for a wonderful recipe! I agree. Love those things so much! So perfect in a salad. Yeah! I love this salad too. I haven’t made it in awhile, I need to add it to my list of things to make for dinner. Thanks for the reminder. I hope you like mine just as much as theirs. I could too! I so miss Sweetgreen! An airtight container should do the trick.